Over the course of the last decade, drones have passed a long road from being expensive tools aimed at professionals to consumer-friendly gadgets for every pocket. In the same period, drones’ capabilities exponentially grew. Cameras went from 720p to UHD, and the flight distances went from a couple of hundreds of meters to dozens of kilometers. One thing remained the same, though – drones are as they were in the time when they first hit the market very fragile crafts that can be easily damaged by bad weather and excessive water. Let’s take a look, then, at some of the best waterproof drones that have managed this issue the most successfully. 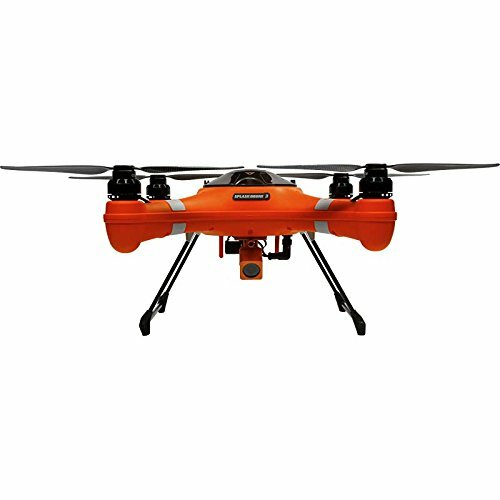 How to choose the waterproof drone? The Swellpro is the only drone that can submerge under water and still take amazing video footage. "Ideal For: Those Passionate about underwater videography"
Some people like to call Swellpro a “DJI of waterproof drones.” Those comparisons are mostly deserved. Although not nearly as competitive, the good people from Swellpro are doing wonders when mixing electronic and water and bringing some very sophisticated elements into this niche. Splash Drone 3 accomplishes this task by packing a 4K camera with 2-axis gimbal (both of them waterproof). As we’ve learned by now, a true rarity in this market segment. Putting, Splash Drone 3 performs extremely well as a drone. It flies fast and stable, the controls are rock-solid and autonomy commendable. Its main issue might be the price. Being too expensive for average users (waterproofing is not cheap), this waterproof quadcopter craft will certainly appeal to customers who like to record 4K footage in extreme conditions. Water skiers, are you there? When it comes to dimension, with the measures of 610 x 178 x 483mm and the weight of 2380g SD3 falls more on the bulkier side. However, you can also mount the unit with 1000g payload which is great news for all the fishermen amongst you. What’s not so great is the flight time of only 16 minutes (the 5200mAh should’ve been used in a better way) which is definitely above the average for this price segment. The control range is very solid and allows you to fly the drone 1000 meters away from you at 57km/h. Being the main selling point of this product, SD3’s camera does a great job at increasing its value. You even get a 14MP resolution, which is a step above from the standard 12MP we can see in this range. The lens has a maximum aperture of f/2.0, a field of view of 106 degrees and a pretty awesome that stretches from 100 all the way up to 1600. The high-res output is great and mostly noise free. Sure, you don’t get any overly fancy options like super slow motion, but you will still be able to capture some amazing footage. Since it’s aimed mostly at passionate extreme shooters, it should come off as a surprise that SD3 is staked with interesting options that make capturing video more interesting and effortless. Some of the highlights are Follow Me, Mission Planning, Circling Flight, and Tap to Fly. Keep in mind, though, that waterproofing always comes with some tradeoffs. Here, it is the lack of sensors. In other words, the craft isn't capable of automatically avoiding obstacles. Be sure to get to know the environment before charting the drone's course. "Ideal For: Those looking for the best value for money "
As for #2, we have a craft that proves that Goolsky doesn’t operate extremely well in the toy/entry level drone market, but has something to say in the upper segments as well. Aptly named Poseidon, it is a very capable craft that scores IP67 waterproof certificate (it can survive being soaked in the water for 10 hours), Level5 wind resistance transmits the image across the distances of 800 meters and can carry a 1200g payload. All this transforms Poseidon from a regular gadget into a tool that can transportation reasonably heavy objects across the water surfaces, even during heavy rain. But, that’s not all. The craft even packs a large torque that you can use to drop fishing nets and dispense baits. A petty unique option that can be of much use in the selected circles of customers. Whilst doing all the things, Poseidon performs extremely well. The plastic shell feels very durable, the controls are tight and responsive, and the flight experience smooth. If you have an itch for fishing, you'd be hard pressed to find a better companion than this unit. In order to carry such a heavy load, Poseidon has to have some serious muscles. This utilitarian approach to design makes it far and away from the sleek, compact models we are used to seeing in this price segment. The unit measures 400 x 400 x 290mm and weighs 2740g which is above the average but certainly not off the charts. A pretty powerful 4500mAh LiPo battery keeps the unit in the air for impressive 25 minutes and fully charges after only 40 minutes. As for the flight range, you can retain a stable FPV connection with the circle of 900 meters and continue to control the craft up to 1500 meters which is pretty impressive talking into account the unit’s prime purpose (a utility drone). When it comes to our list of best waterproof drones, the Poseidon is the leader in specifications. Unfortunately, the camera is really not impressive, especially compared to some other units that sell at a similar price (but lack waterproof certification). That being said, 700TVL output, awkward as it is, looks very decent and, what’s even more important, works more than well for FPV transmission. Remember, this is a waterproof fishing drone that can sit for 10 hours at the bottom of the ocean. The fact that you can actually shoot decent videos with it is a huge plus. Poseidon might have a sub-par camera, but it more than makes up for it with a wide set of features which has no problem standing toe to toe with the competition. You get all the usual suspects – RTH, headless mode, and Waypoint mode, but also a welcome addition in the form of Altitude Hold option provided by the built-in barometer. The unit is operated with a controller with the attached 7-inch display, which is always good to see. You need your phone for other things. "Ideal For: Kids and beginners looking for a waterproof drone "
Goolsky Q353 Triphibian is a product that is much in the same vein as the previous. A toy drone that packs a couple of interesting surprises. Design-wise, things have moved in the right direction. Instead of once again going with the classic quadcopter design Triphibian is built more like a boat upgraded with four propellers. This makes all the difference in the world because the craft can securely land on and take off from the water. Also, the drone packs a set of small wheels on the bottom (hence the name Triphibian). If you, for whatever reason, want to take this bad boy to a ground ride you can do that as well. The second welcome upgrade comes in the form of controller packed with a nice blue LED display that gives you essential feedback on the drone's status. On the downside, the buttons on the controller are not marked which is a curious decision so you’ll have to memorize the layout or keep the manual in the back pocket. As for the controls and flight experience, no complaints in this area. So, the unit does a lot of things differently to warrant a mention on this list, but still falls short in some important departments. One of the things this unit does right is to improve upon the control range. This time you can push the craft up to 150 meters away from you. Unfortunately, with the battery of 1200mAh which at first seems pretty decent can keep the unit going for no more 6-7 minutes so you won’t have an opportunity to do much exploration. After that, you will have to wait two long hours of recharging. The dimensions are what you would expect from a unit of this type. The unit weighs 323g and measures 365 x 365 x 12mm. It’s nice and compact. The people from Goolsky have once again managed to squeeze all the basics into something that struggles to be called drone rather than a toy, which is more than commendable. A feature that will drastically improve your experience while using the craft is the option to switch between Drive/Flight/Sail modes. This inclusion will adjust the controls to the current regime and prevent some nasty crash-landings. "Not the most durable, and more water-resistant than waterproof "
Floating somewhere between toy drones and entry-level crafts LiDiRC L15FW manages to do a lot of good things while still remaining firmly below $100 mark. For a start, you get an entry-level camera which is a huge upgrade over the previous model we reviewed. This time, you can actually do something useful while flying. You even get an FPV link to your controller (once you mount your smartphone on top of it). Sure, the resolution is not that great, but at least you get an option. The craft controls superb and you won't have any problem performing all the maneuvers that cross your mind. The build quality is solid and the body of the craft is riddled with two-colored LED lights (blue and orange) that make night flights that much easier and, to be quite honest, look pretty cool. All in all, a pretty solid craft that pushes the boundaries of what can be achieved with toy drones. As you would expect, LiDiRC’s entry to the toy drone range is very light and compact with measures of 340 x 125 x 230mm and weight of only 970g. Unfortunately, this drone suffers from poor battery capacity as well. According to the manufacturer, 550mAh is sufficient to keep the craft in the air for 8-10 minutes, you will rarely be able to squeeze that much, even indoors. Control range falls in line with the rest of the specs and allows for some pretty decent 100 meters of distance. According to the manufacturer, the craft can be submerged into water for five hours before being damaged. As for the camera, it’s what you expect of 0.3MP resolution. The best way to describe it would be serviceable. The recorded footage is choppy and can’t be used for editing, so the 720p mark you can find on the box serves more as a wishful thinking rather than real spec. But hey, at least you can play around the neighborhood, use the drone for recon when you are in the wilderness and record some fun stuff when fishing. At this price point, it’s more than enough. Much like the previous mention, LiDiRC L15FW packs only the barebones functionalities necessary to make it a serviceable drone. But, you do have RTH and Headless Mode, three flight speeds, and an option to make 360-degree rotations. "Good toy drone for kids, but lacks real special features that come with the high-end drones"
Goolsky is a drone manufacturer that may not be as prominent like DJI or even Yuneec, but nobody can deny they have one pretty solid business model. Namely, the market corner of toy-grade waterproof drones is pretty barren. Without too much effort Goolsky politely stepped in and filled that void. That doesn't mean this is a bad craft. For what it is, and what it cost it performs very well. Flying feels smooth and snappy, controls are ok, and the drone won’t get damaged if splashed or submerged into water. But, there is one huge but. If you land the craft on the water surface it will start sinking like a stone, so do your best to keep the motors on until you retrieve it. Also, at this price point having any decent camera or camera at all is out of the question. Bottom line, Goolsky JJRC H31 is a great toy you can use to introduce your children to the world of drones or even sharpen your flying skills before you move to more serious and more expensive models. And, that’s pretty much it. JJRC H31 is one incredibly small and compact unit. It measures no more than 290 x 290 x 90mm and weighs only 730g. That, theoretically, should produce a very decent flight time, but with the battery of only 400mAh, the craft can stay in the air for only 8-10 minutes. After that, you will have to undergo a tedious one-hour charging session. As for control distance, on the paper, the drone can be controlled 70-80 meters away from you. In reality, you will start losing signal once you pass 60. However, that’s ok, since without any kind of camera the craft can’t be effectively controlled on longer distances. Although not a feature-rich craft, JJRC H31 manages to cover all the basics. You get a Headless Mode, and controller features One Key Return function. The drone can also perform a couple of tricks like 3D flips, but once the novelty wears off, they become pretty useless. Still, a nice option to have. A waterproof drone is a curious beast. Although it seems that the main quality these crafts should be measured against is whether they are actually waterproof or not, there is a lot more going under the surface here (no pun intended). Being immune to water doesn’t necessarily make a good craft. Here are some other features you should put your focus on while purchasing. A waterproof drone comes prepared for hell or high water. It would be such a waste to limit its potential by choosing the unit that has poor battery life and flight range. Buying your craft enough time in the air will also make RTH flights more carefree and drastically improve the safety of your purchase. Taking into account that you are going to fly your craft in poor weather conditions (you are after all buying a waterproof drone), you should try to get as much flight assistance as possible. This useful feature is enabled by a set of environmental sensors and precise GPS/GLONASS modules, so put these entries on your checklist. Poor weather conditions (or submergence into water) equal to poor picture quality. If you want to get a decent output you should opt for the units with 4K waterproof cameras. Also, take the gimbal stabilization (the technology that keeps the camera in place and prevents shaking) as an absolute prerequisite. Drone features usually come in the form of flight options and intuitive shooting regimes (although, the upgradability of the unit ant the content of the package should not be overlooked. The two things you shouldn’t buy your craft without are Headless Mode (it allows you to navigate the drone relative to your current position) and RTH (Return to Home) which automatically flies the drone back to the takeoff point whilst avoiding obstacles along the way. Can you waterproof your regular drone? Answer: There are several scenarios in which this could happen. Yes, to an extent, especially if you have a modular unit. Also, various manufacturers are producing upgraded shells and coatings you can use to make the drone more resistant to water. The best level of protection can be achieved if you disassemble the unit and spray the electric components with hydrophobic spray. However, this operation is very expensive and requires a lot of skill, so it should be left to professionals. Can you fly a regular drone over water? Answer: A lot of people are afraid to fly their expensive quadcopters over the water surfaces. These fears are unfounded because flying over water does not require any distinct flying skills. Still, if you want to keep your drone fully safe, check the battery level before take-off, avoid strong wind and keep the distance from the water. Answer: The IP rating or International Protection Code is an internationally agreed code that describes some unit's resistance to solid particles, liquid ingress, and mechanical impacts. 7 – Immersion up to 1m. 8 – Immersion, 1m or more. Can an amphibious drone be operated underwater? Answer: Ideally yes. An amphibious drone is a piece of tech that can be successfully operated both above and underwater. However, you should know that constructing such crafts is an incredibly demanding engineering task, so the true amphibious drones are still not widely available. The units that carry this mark are usually ordinary waterproof drones that can land on the surface and eventually allow you to pilot them on the surface, like boats. Can drones fly in bad weather? Answer: It really depends on the units. Most of the crafts can survive short trips to the takeoff point during very light rain. Waterproof drones can easily deal even with the heavier downpours. The real problems here are the heavy wind and snow. So if you are living in a windy area buy yourself a unit with more powerful motors and wind-resistance certification. As for the latter mention, even if your unit is resistant to water the small snow particles may completely disrupt its sensors. So, if it’s snowing outside it’s best to keep the drone on the ground or at least not rely too heavily on its obstacle avoidance capabilities. We hope you enjoyed this roundup of some of the best waterproof drones available for all budgets. Tell us what you think, share the post with your friends on Facebook and tell us about your experiences while flying in bad weather. RC Car Kits – Can they Improve your RC Car’s speed?